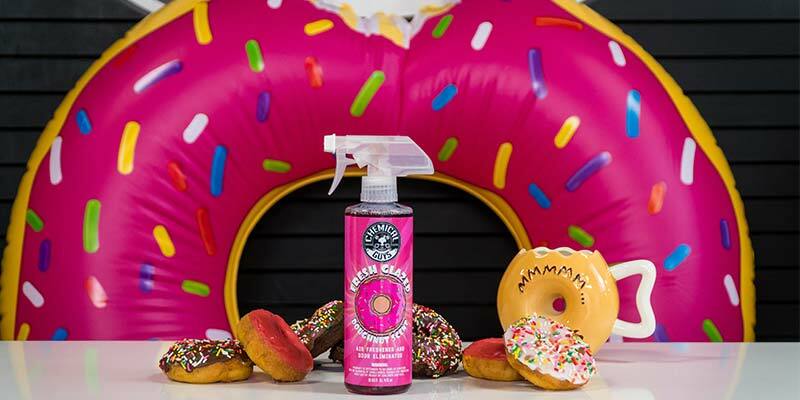 - The smell of a dozen fresh Donuts in every spray! There are few scents as delicious as fresh-baked Donuts, so why anything else? 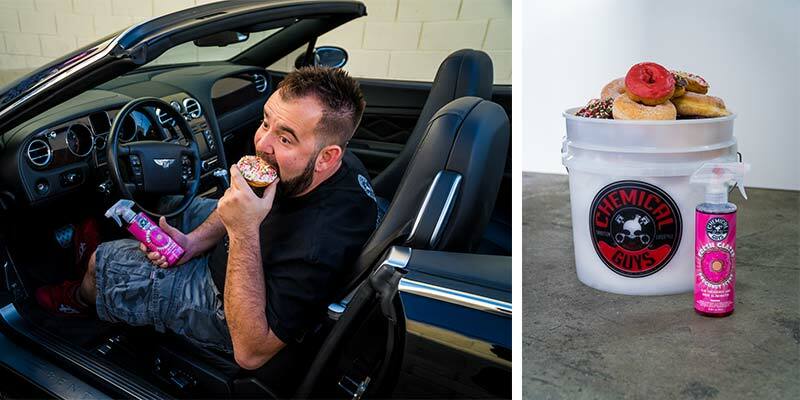 Introducing Chemical Guys Fresh Glazed Donut Scent: the air freshener and odor eliminator combo that replaces foul odors and smells with the delicious scent of mouth-watering Donuts! 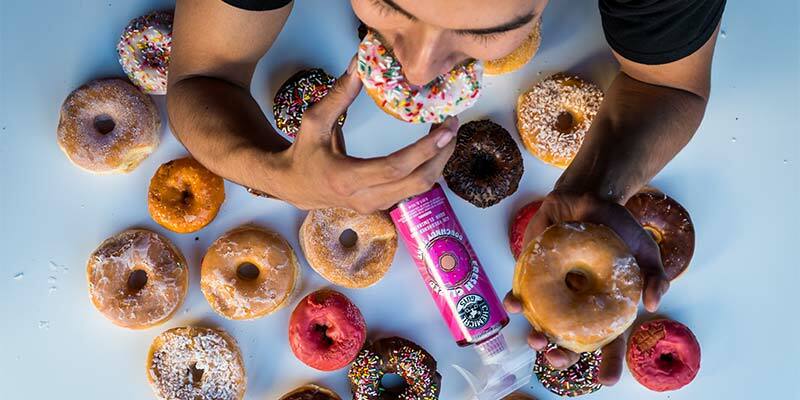 Now you can enjoy the essence of warm fresh-made donuts without any of the guilt, calories, or grams of saturated fat. One spray of Fresh Glazed Donut Scent will fill your car with that heavenly aroma that normally wafted from the box your friends fought over tug-of-war style in the back seat. And unlike cheaper air fresheners, all Chemical Guys scents are functional odor eliminators. Active enzymes seek and destroy odor-causing maladies to stop odors at their source. Replace funky AC smells, stale french fry stench, and lingering B.O. with the fun fragrance of warm fresh-baked donuts. 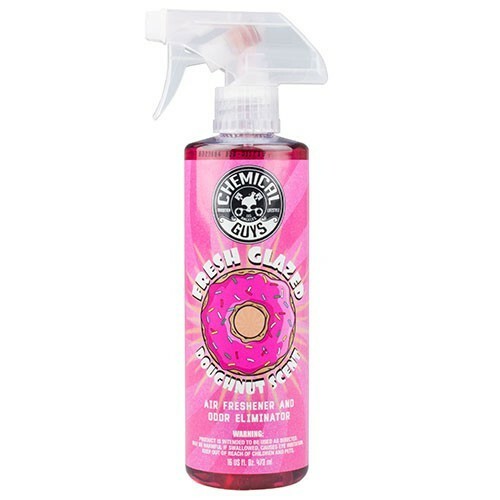 Chemical Guys Fresh Glazed Donut Scent is for the fan of fresh-made donuts hot out of the fryer. What’s your favorite part of walking into a Donut shop? Is it the bright red neon sign in the window, the smiling crew waiting to serve you, or that warm delicious that rolls over you as you walk through the door? Mist a couple sprays of Fresh Glazed Donut Scent in any enclosed car, truck, RV, or SUV to remove the stale smell of old fast food meals, soccer practice, and trips to the dog park. Camping out in front of the donut shop to enjoy the smell of fresh Donuts is impractical and tempting! 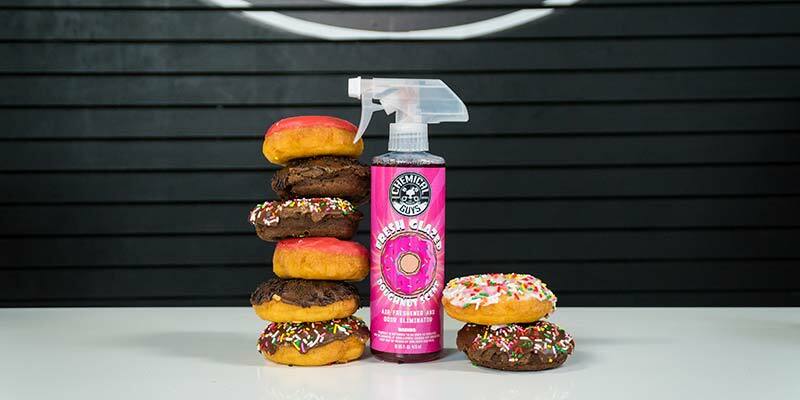 Satisfy your late-night donut craving with just a couple sprays of Chemical Guys Fresh Glazed Donut Scent, and enjoy all the delicious and savory smells with none of the health risks that come with excessive Donut intake. Chemical Guys air fresheners are odor-eliminating products at their core. Cheaper manufacturers try to mask foul smells with overpowering perfumes that give you headaches, and cheap oil-based formulas can leave behind sticky residues that stain fabrics and promote germ growth. Chemical Guys went the other way, and used active enzymes to physically destroy odor-causing maladies to eliminate foul smells right at their source. 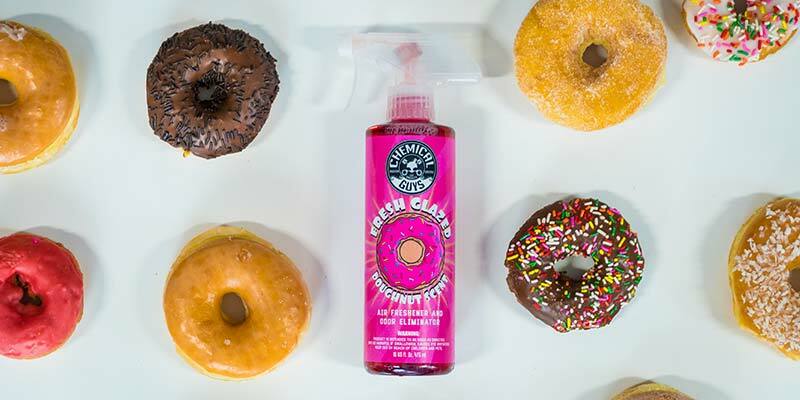 A few mists of Fresh Glazed Donut Scent permanently rubs out lingering odors and funky AC smells from any family car, rec room, locker room, or other shared space. The water-based formula is gentle for use in any space, and will not stain fabrics or promote germ growth on the surface. 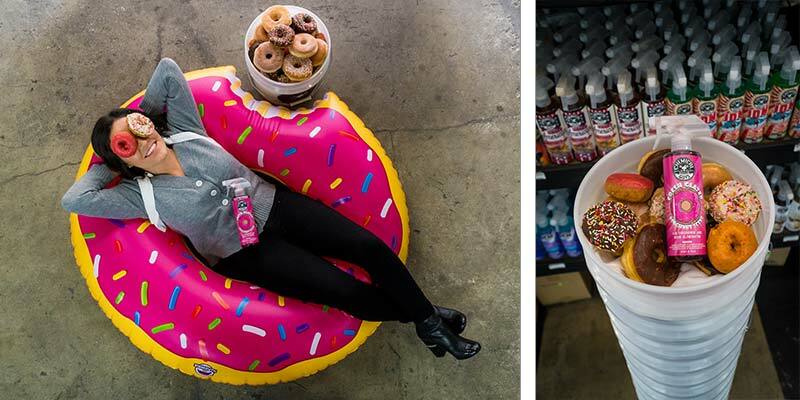 A few sprays of Glazed Donut Scent removes foul odors and helps prevent new ones from taking their place. Savor the smell of sweet sugary glaze, fluffy cakes, aromatic spices, and top-secret ingredients. This is a scent to enjoy and savor for weeks, not days. One spray is all you need for a full size vehicle. 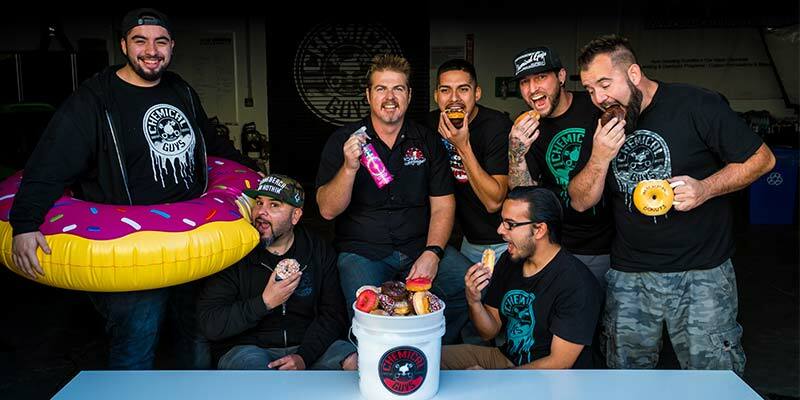 Enjoy the delicious scentof hot and ready Donuts with Chemical Guys Fresh Glazed Donut Air Freshener & Odor Eliminator.